Carte du Diocese de Beziers. 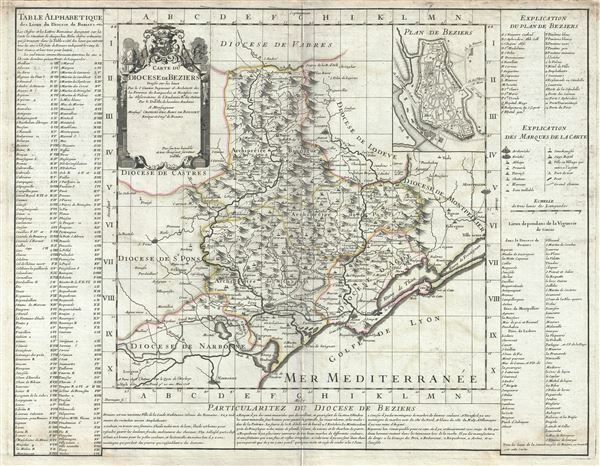 This is an attractive 1708 Guillaume De L'isle map of the Diocese of Beziers and the Department of Herault. The map covers part of the Languedoc-Roussillon region in southern France from the Orb River and Autignaguet south, past the city of Beziers, as far as Narbonne and from Saint-Pons-de-Thomieres east to Montpellier. The map renders the entire region in extraordinary detail offering both topographical and political information with mountains and forests beautifully rendered in profile. The city of Beziers is famous for its bullfighting festival Feria de Beziers held every August. The department of Herault is home to a wide variety of vineyards and is part of the larger Languedoc wine-growing region, the oldest in France. The red wines produced here are meaty, tannic wines with a deep red color. The area is also known for its production of Pelardon cheese, made from goat's milk, and Perail, a ewe's milk cheese. An inset featuring the plan of the town of Beziers is included in the upper right quadrant. Explanations and keys are included on both sides and bottom of map proper. A beautiful title cartouche adorns the upper left quadrant of the map. This map was issued by Guillaume De L'isle in 1708. Very good. Minor wear and toning along original centerfold. Original platemark visible. Minor dampstains in lower left and right quadrants. Some offsetting and spotting here and there.